Brochure is rated 4.8 out of 5 by 50. Create a brochure that tells your product's story. "Brochures give me an attractive and interest-grabbing display item for vet offices, groomers, etc… I love having the option of having the brochure inspected through your art department. It adds a level of security." Rated 5 out of 5 by Heather from Clear crisp print I loved how the graphics team made sure the brochure was perfect before they printed it! Thanks! Rated 5 out of 5 by PMONTS from Easy and Professional Always a pleasure, easy and fast, great value. I would recommend. Rated 5 out of 5 by Kristi from Excellent The brochures were done with excellence & quick turn around time! The same goes for anything else we've ordered. Rated 5 out of 5 by Rozz from Great Printing of Nexgen Brochures We order our product and it was ready for pickup on the date as promised. Rated 5 out of 5 by Ross from Fast and great quality The perforation was well done. All the images are vivid and printed correctly in great color. Definitely will be ordering more. Rated 5 out of 5 by simple123 from Great work and great staff I brought my brochure a week ago and it worked out really well. I need a rush over night printing job for a Saturday event and I was able to pick up the brochure at 9:00 the morning after I turned in my order.Great job. Rated 5 out of 5 by UHmanoa_art from Nicely done print quality is good and good price point. Can't go wroing. Rated 5 out of 5 by Dani from Good Quality Good quality, print, and colors. Tear-off works great! Rated 5 out of 5 by MacNexus from Simple and Quick I really appreciated that PrintPlace still had the specs on the original order placed several years ago. I needed to update our brochure, and couldn't remember the details of paper weight, perforations, etc. The turnaround was quick and the product was exactly what we wanted. Rated 5 out of 5 by Spitfire from Great Quality. This our 4th order of brochures that help educate our customers. They are invaluable. Rated 5 out of 5 by jonH from Great Service! We had a custom size brochure and need some assistance with the proofing and production. My rep took care of everything and delivered on-time. Rated 5 out of 5 by Sincere Gifts from Absolutely incredible customer service and quality I really have to say, I wish there were more than 5 stars. PrintPlace.Com went WAY above and beyond to ensure that my brochures were delivered to me by the time I needed them for a one-night only special performance. Not only did the order get to me on time (which was in jeopardy due to a horrible screw up by DHL and USPS that had nothing to do with PrintPlace) thanks to the actions of their customer support team, but the folded brochures looked simply amazing. PrintPlace's print vibrancy and color matching of my files was perfection - I've experienced serious color mismatch when printing with PP's major competitors, as well as really dark prints. PrintPlace's prints look exactly like my computer monitor come to life. The whole PrintPlace experience is as close to a perfect customer experience as I've ever had. Rated 5 out of 5 by KJT5 from Brochures I would have gone with a heavier paper but the brochure printed as it looked in the preview. Very nice. Rated 5 out of 5 by Aaron from Customer Service! They went above and beyond to make sure that my order was just the way I wanted. Rated 5 out of 5 by Karen from Great job My second time ordering. The whole process was very easy and the quality is excellent. Rated 5 out of 5 by Dr. Jane from Brochures look beautiful! This process was very easy, the service was excellent, and they arrived very quickly. I was amazed at how nicely they looked! Better than expected. Thank you. Rated 5 out of 5 by All Access from Looks great, excellent pricing! Our tri-fold brochures turned out great, were easy to order, the pricing was excellent, and they arrived right on time! Thank you! Rated 5 out of 5 by hailey from Quality product, fast turnaround! These brochures were a great price and arrived quickly! They look great! Rated 5 out of 5 by Stacee from Great quality! We are so happy with the quality of our order! We will definitely reorder when we run out. Rated 5 out of 5 by Kelly from The PRINT PLACE is now our go to for all our print WOW. You guys blew me away! First, your website is so easy to use. I've been in graphic design for 3 decades and never have I seen such VIBRANT colors, FAST turnaround and WONDERFUL customer service. Boy, are you ever my go to printer! Rated 5 out of 5 by ico2004 from Wonderful products, great price, great quality I have been using Printplace for ~7 yrs. They are very good. They are super fast and always very helpful if I have questions. If my proof is incorrect due to my error, Printplace is very informative and helps me correct the problem and get a better outcome. Rated 5 out of 5 by Perception Graphics from Great Job Print Place always does a bang up job on my brochures! Rated 5 out of 5 by MissDinna from Exactly as expected Our brochures look great. Solid stock. Good colour representation. Rated 5 out of 5 by Rhonda from Perfect The brochures that I ordered were perfect. The paper quality is spot on. The colors are bright. We have been ordering this product once a year for several years. Every year, it exceeds expectation. Thank you. Rated 5 out of 5 by lowtechtom from Professional Grade! This product came much quicker than expected and is of greater quality than expected as well. Rated 5 out of 5 by Jlkclover from Fantastic job! With a few minutes of online help to answer my questions, I was able to place my order which arrived exactly as I’d hoped. Fabulous quality! Rated 5 out of 5 by ParkersPlace from Full Color Tri-fold Brochure Looks Great! I'm a longtime customer of PrintPlace and my tri-fold brochure looks just like I expected it to look thanks to PrintPlace's fool proof templates. Rated 5 out of 5 by John D from Great Work I've used PrintPlace for all our printing needs. They are quality printers and very easy to deal with. Putting together a professional brochure involves much dedication and several steps within the process. Even though brochure printing is the last in line for the entire process, you need to know beforehand what decisions will be involved as they affect the design. Before you begin the layout, use this guide as a reference for your brochure printing decisions. Decide which size you want your brochure to be. If you change your mind, be sure to make the changes yourself rather than asking a printer to resize it for you. Designing on the wrong size causes the end result to be stretched or important information to be cut off. Standard brochures are 8.5x11 but other sizes include 11x17, 11x25, or you could go smaller with a 4.5x5.5. The tri fold brochure can break down information into different sections. The z-fold brochure can unveil an engaging infographic or several design elements. The gate fold has two front panels that open up to reveal the third. 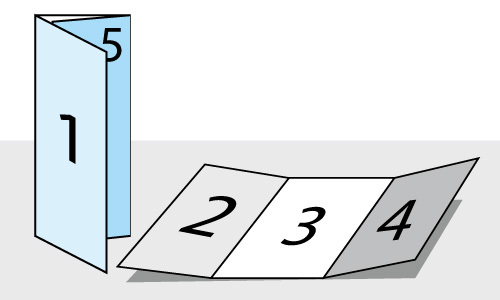 The double parallel fold has four vertical panels you can use to expound on several product lines. The accordion fold unravels like the instrument, enabling customers to read all four panels as a whole. The roll fold is popularly used by retail stores, hospitals, and hotels. The double gate fold is similar to the gate fold but with more room for visuals. The french fold provides four equal panels that unfold into a large image. Upload a ready-made design or use our brochure maker today. Our print experts are also available to discuss your brochure printing options. Using a template will insure that you design on the correct size and will also help with bleed specifications. Check with your printing company to see if they offer templates as this will make your printing process smoother and prevent important text and images from getting cut. Your graphics need to be the correct resolution to avoid a fuzzy appearance. Use a resolution of at least 300 dpi for the best results. When saving your brochure to a different file format, double check your resolutions to make sure that they remain the same. The colors that you use can vary greatly from their appearance on your computer screen to the printed page. Purchasing a printed color chart for CMYK and PANTONE colors will help you know exactly the color tone you will get in your brochure. If this is not an option for you, calibrate your design program with your monitor using software available online. Brochures are usually printed on heavy text or cardstock. Using a text paper, such as 80# provides durability but is also easily folded. This paper stock usually comes with an gloss coating for protection and shine. If you decide your brochure needs more protection, you may want to go with a 100 lb paper and a heavier gloss coating, such as UV Gloss for sheen or a matte. If you know that your brochures will be placed in a 3-ring binder, you will want to have them hold-punched. For brochures that include a removable panel, such as a mail order form or discount coupons, don't forget to ask about perforation options. The last consideration involved in brochure printing has to do with what type of proof you desire. A proof gives you the opportunity to check for typos and correct alignment of text and images. Many printers offer electronic proofs, which are the most cost-effective choice. A physical proof, though, shows you exactly what your brochure will look like when complete, something that a computer screen just can't duplicate. What is the difference between the 10 pt. and 14 pt. cardstock? The 10 pt. cardstock has a heavier weight than paper stock, with a thickness of 0.010”. This material is also used for business cards and postcards. The 14 pt. cardstock is made out of cardboard paper and has a thickness of 0.014”. It is similar to the paper used on folders. What does “scoring” mean and how is this different from folding? Scoring creates a crease in the paper to indicate where the fold should be. It serves as a guide for folding the brochure neatly. Which orders are delivered folded and which ones comes scored but not folded? All paper stock and 10 pt. cardstock orders come scored and folded. All 14 pt. cardstock orders come scored but not folded, so customers will have to fold these themselves. How should I organize my brochure? Use the panel number to guide you through designing and organizing the information on your brochure. The first panel serves as your cover and should include your company name and logo. The second to third or fourth inner panels will discuss your business using visuals and engaging copy. Place all your contact information on the outermost back panel. What are the most popular folding options and their best uses? Trifold brochures can break down important information in three different sections. The French fold gives you four equal panels that unfold into a larger space that can fit a map or several schedules for a convention or week-long event. The accordion fold unravels like the instrument, enabling customers to read all four panels as a whole. Promotional brochures come in many sizes and can be folded many different ways, the most common being the tri-fold brochure. This fold creates three equal sections by folding the sides over the middle. Most tri-folds bend the right side first and then the left so that when opened, the brochure reads from left to right. 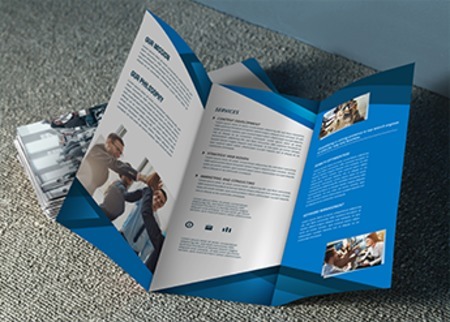 Knowing how to lay out a tri-fold brochure can be confusing without a guide. Below is an explanation of the pages and what information is usually included in each section. Even though tri-fold brochures can be any size, the fold is usually based on the landscape view of the paper. The numbers assigned to each section indicate the order of appearance when the brochure is unfolded and read by a client. When designing the front, sections 2, 3, and 4 are showing, respectively. The back of the flat paper reveals sections 5, 6, and 1, respectively. Section 1: This first section is the front flap of the folded brochure. Usually this outside front cover includes an image, the name of the company, and a strong message that entices the reader to open the brochure and continue reading for more information. Section 2: The reader unfolds the brochure to see the inside front cover. Many consider this section to be the most important because it should elicit an “I need this and can’t live without it!” response. Often this flap contains both questions and answers that tell the reader why this product, service, or event is necessary. Sections 3 & 4: Next the reader opens the brochure to see the entire interior of the brochure. The middle and right interior panels usually contain further information. This section can become too muddled with lots of text, which is why many designers choose to use many headers and subheaders for organization. Section 5: Often, this outside flap includes a tear-away order form, a ticket to an event, or sometimes extra information such as testimonials. Or this panel could include blank lines for note-taking, a mini-calendar, or a discount coupon. Section 6: The outside back panel is usually reserved for contact info, the logo, or possibly a map. 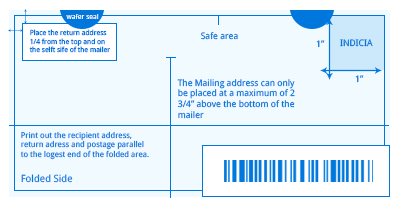 If used as a direct mail piece, this back section reserves a place for the mailing address and stamp. Or if section 5 contains a form that the client will fill out and mail, this back side of the outside flap should contain the company address and a postage stamp box. Of course, each brochure printing project will vary in the layout according to the purpose. The design of any brochure, whether a tri-fold, Z fold, or gate fold, should always support the message which is why layouts of brochures can differ considerably from one another. Need help with creating your design? Let our free templates help you make a brochure with ease. We have templates for different sizes and folds. You can also use these to check your design file before submitting them to us for printing. Note that all listed sizes below and on the calculator measure the brochure before folding. Let us take care of your mailing. We will mail your brochures inside a #10 envelope. Expect your customers to receive your delivery on time. Depending on your brochure’s material, we include a wafer seal or brochure tabbing so that it is mailable and follows the mailing guidelines. To prepare it for mailing, the brochure will open from the top and the folded edge is at the bottom. Click on the "advance options" link in our calculator to compute the price. To prepare it for mailing, the brochure will open from the top and the folded edge is at the bottom. The wafer seal or brochure tabbing will appear as follows, depending on the material. Those who prefer to mail their brochures in an envelope can call our mailing experts for more details. For details about mailing requirements such as size and tabbing specifications, read our Brochure Mailing Requirements. You can also clarify any questions with our print experts. A brochure can give a lot of information without overwhelming the reader. Each fold organizes details and lets visuals tell the story in a compact format. It’s one of the best ways to introduce your business or showcase a new product line. • Tell the story of your company – Break down your business’ history and remind customers of your value. Showing the personal side of your business will make your customers feel welcome. • Explain a popular service – Show how a particular service can be useful to your customer by giving them specific examples, such as the benefits of the cleaning product you use or the long-term benefits. • Illustrate how your product works – When a photo isn’t enough, more room for a product demonstration can come in handy. Brochures have enough panels to highlight the details of each illustration and step. • Detail an upcoming event – Include a schedule and all information about an upcoming event. Anyone interested will hold onto your brochure and use it to guide them on the day itself.